The American Short Line and Regional Railroad Association’s CONNECTIONS meeting brings together railroads and suppliers each year. This year’s show in Orlando runs April 6-9 and features a number of both new and traditional industry suppliers. CorrSolve Corrosion Solutions is a first time exhibitor at the show. The company was founded 30 years ago to supply the aerospace industry and is getting more involved in the rail industry. Inside Sales Manager Leonel Rodriguez says that the Texas-based company’s sealants are idea for many uses on locomotives, signal bungalows, and other locations where antennas and wires need to pierce a surface. 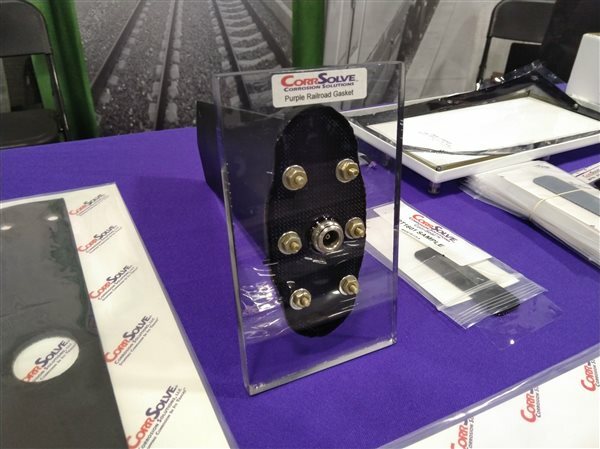 The products, including gaskets, sealants, and tape, are “well received” at the show, according to Rodrigues, adding that the company has had many requests for this type of product in the rail industry. He notes that the products help prolong the service live of a railroad’s equipment and are considered non-hazardous, which simplifies shipping. In contrast, Missouri-based supplier Transportation Products Sales Co. is marking 30 years of service to the short line industry at this year’s show. “For the past 30 years, our (short line) program staff has helped railroads start their engines, recharge and recycle their batteries, light their signals, gather power from the sun, and find protection from lightning strikes,” says CEO Debra Winzen. The company entered the short line supply market in 1989 three years after the company’s founding to serve Class I railroads. It now has 11 locations across North America. The trade show wraps up Monday night while educational sessions continue on Tuesday.